Located on the beautiful 76 Strip in Branson, Secret Garden is a unique store that offers handcrafted jewelries, accessories, women’s clothing and many more. This timeless romantic boutique is inviting visitors of all ages to browse from the wide selection of displays and see what you can find in the store. Shopping in Branson can always be enjoyed in shopping malls with hundreds of retail outlets and specialty stores but your shopping experience at Secret Garden can be different as this shopping spot is specializing in very unique feminine items which feature a romantic Victorian flair as well as trendy junk gypsy Bohemian looks. At Secret Garden, you will find soft knits, washable fine linen, lace and beautiful silk velvets from their own designers, many of which are handmade. This unique shop will be happy to ship your selected items from Monday through Saturday. Please take note that many of the items offered in store are handmade, and if there’s no stock, you can arrange special ordering for delivery. You may call the store to order or via email for sizes, pricing and availability. With a vast display of vintage-inspired clothing, accessories, gifts, jewelry, and collectibles, visitors to the Secret Garden in Branson will feel as if they have travelled back into the Victorian era. Many of the shop’s clothing items are handmade, hard-to-find, and all the items feature The Secret Garden’s own private label. The styles and designs of Secret Garden items are appealing to women who prefer classic from evening wear to cookie-cutter fads. As all of the items and accessories offered by the store are originally made, some of the area’s top female entertainers such as Lennon Sisters, Lorrie Morgan and Alison Krauss visit the place frequently. When Secret Garden opened its door in the early ‘80s, it made them as one of the oldest boutiques in the Branson area. About eight years ago, Richard and Bobigene Fent purchased the shop and they have since doubled the business’s size to include complementary shop, Goosey Goosey Gander, which features contemporary, elegant clothing and many beautiful home décor items. Secret Garden was started because of the owner’s passion for gardening and a desire to have unusual outdoor décor, which was difficult to find in the Branson area. The shop then offered a wonderful selection of home and garden furnishings, specializing in statuary, arbors, fountains, urns, topiary frames, iron wall décor, gardening tools and accessories, candles, fabulous gifts, and a vast display of home décor items. The items that are on display in the store such as clothes, jewelry, shoes, and accessories and so unique that you can’t find them anywhere else. You can always find something new at the Secret Garden. 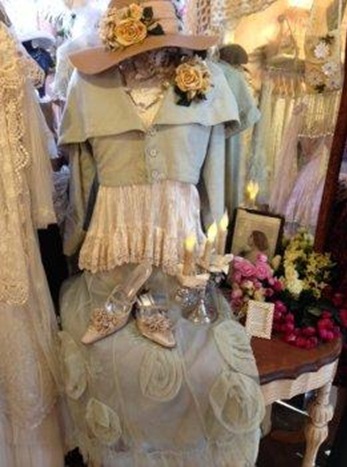 This boutique is the perfect place for you if you love to wear Victorian style clothing. If you want to experience a unique shopping in Branson, find that special items you are looking for at the Secret Garden as the store offers a wide selection of handcrafted jewelries, accessories and many more.